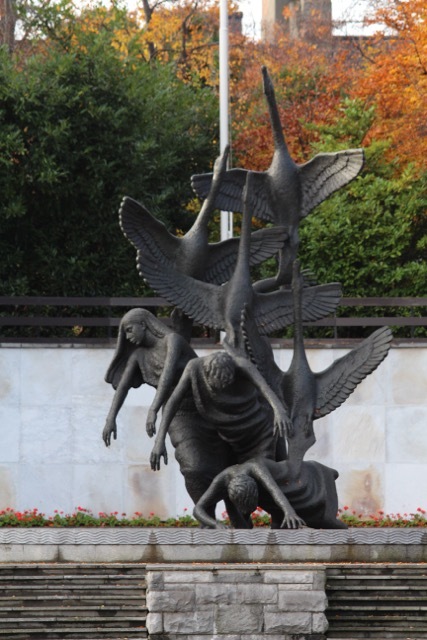 In the Garden of Remembrance (Dublin). 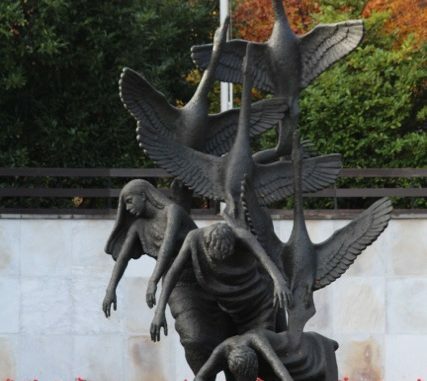 The mythological Children of Lir changing into swans signifying exile, suffering, and transformation. It was in May of 1921 during the war for independence when your granduncle Maurice came visiting your grandfather in the family farmhouse. We had all just sat down to dinner when an alarm was sounded; the house had been surrounded by a large contingent of government soldiers. Within a few minutes of their arrival, a number of them entered the house through the front and rear doors. We were ordered out of the house and made to stand in the center of the farmyard under armed guard. All the while the buildings and farmland were thoroughly searched, each member of the family was individually interrogated (we the children particularly vigorously), but all of us maintained that Maurice was not there. The dinner table had been set for twelve, though only eleven of us stood in the yard. For some reason neither the commanding officer, who spent a good deal of the time in the dining room, nor members of the search party paid sufficient attention to notice the discrepancy. As the tale was being related, I felt myself being placed into a state of wonder, a mysterious state of silent witness transcending both time and dimension. I had spent hours of childhood around this old farmhouse, playing and exploring in its rambling orchard and meadows. As the story resonated within me, I was placed for a few vivid moments into that day in May 1921, and it was seen through my eyes where it was that he had made himself “invisible”: not up the wide peat-scented old stone chimney, under a bed, or in a closet, but where he hid was so obvious, you needed to be available to simplicity to recognize it. There is a truth in the old adage, there are no secrets; it’s just that we do not see. If you wish to hide something from others, the best ways to do it are to put it inside them or straight in front of them; Maurice had no choice but to apply the latter. I suspect the years of monastic discipline and the austerity of war helped him to remain there during the long hours of waiting, hanging by his arms, utterly still. In 1919 Maurice had left the Cistercian monastery where he had been a monk to fight in a revolutionary war against a colonial government whose rule by then was no longer accepted by the majority of the population. He never spoke of, neither did I ever feel the need to ask him about, the past. In his advanced old age, I would sometimes come and sit beside him. He was blind by then but all the more sensitively present to himself and his surroundings. He had come to answer to an inner spiritual authority and conducted himself in accordance with that influence. Maybe it was towards this steady influence emanating quietly through his presence that I felt drawn. We met one last time on a summer’s evening in 1972 as the sun hung its radiance in the western sky, and words spoken then from his silent aloneness shone through me: Violence achieves nothing. I found no contradiction in his transition from monk to soldier, and in a way he returned as an experienced old man to where he began (or for that matter, never left), to the quality of fearless being which is the making of a warrior. In this, he followed the ageless internal path of men suffering to become those rare warriors who, in their religious outlook, transcend violence. 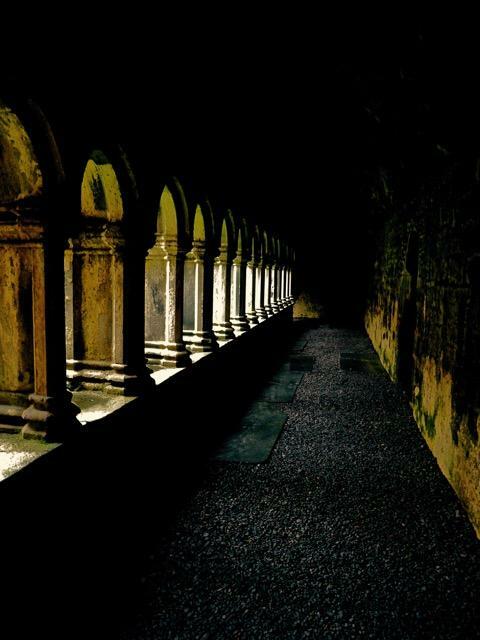 Cloisters, Quin Abbey, County Clare, Ireland.